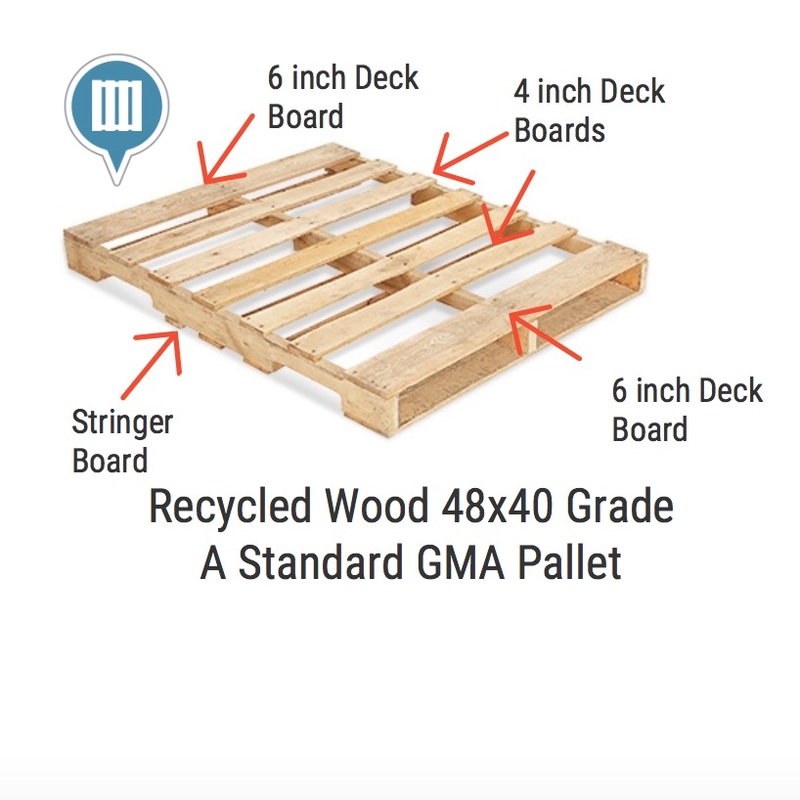 The standard sized pallet in the United States is GMA 48 x 40 stringer pallet. This is used by most businesses that ship products on pallets. A stringer pallet has a 3 or more boards that make a frame along the side of the pallet. The deck boards are attached to the top of the stringer boards. There are many types of stringer pallets. Stringer pallet prices are very affordable. Block pallets are very popular in large grocery stores like Costco and Sam?s Club. 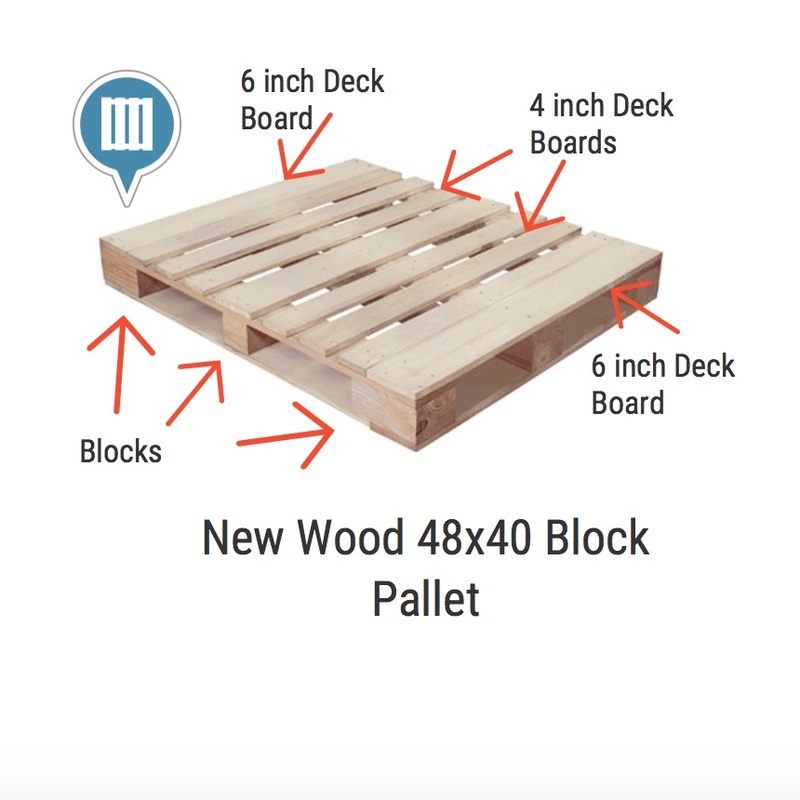 A block pallet is made of 9 blocks that are connected by the deck boards. This makes the block pallet stronger than the stringer pallet. Some grocery stores require you to buy block pallets. Deck boards: boards that are across the top of the pallet which the products sit on. Stringer boards: Boards that make up a frame for the pallet. Stringer boards can be solid or have notches that make a 4-way entry pallet. Lead board: Lead boards are the deck boards at the front and back of the pallet. These boards are typically wider than the middle deck boards. Lead boards are typically 6 inches wide. Lead boards provide strength to the pallet. Nails: Nails or fasteners are used to keep the pallets together. Splicer plate: these parts are used to repair broken or cracked boards. Skid: A skid is a pallet that does not have bottom boards. Heat treated: Pallets need to be heat treated to prevent the spread of diseases and bugs from lumber products that are shipped internationally . Deck board spacing: This is the spacing between boards on the top of the pallet. Notched: Stringers are notched so that a forklift or pallet jack can enter on all 4 sides, otherwise known as a 4-way pallet. 4 way entry: A pallet that can be entered by a forklift on all 4 sides. 2 way entry: A pallet that can be entered by a forklift on 2 sides. Block pallet: A pallet build with blocks. 48x40: A standard sized pallet. Here is a list of the most common types of damages to a pallet. Objective: To make the repairing as safe as possible to the employee repairing the pallet and as quickly as possible to reduce the cost of the pallet repairs. 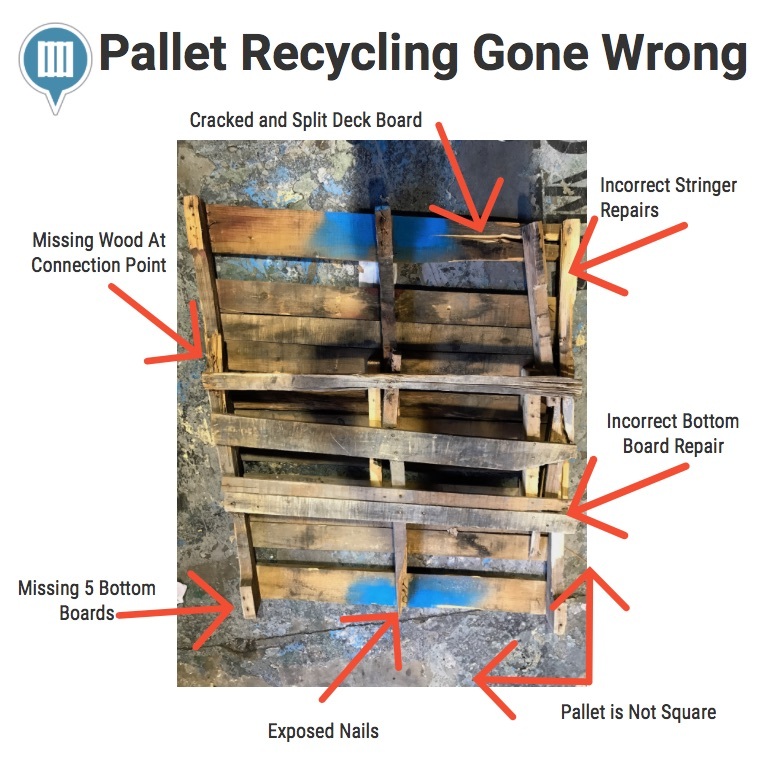 Objective: Make a used recycled pallet the same durability and structural integrity as a new pallet. 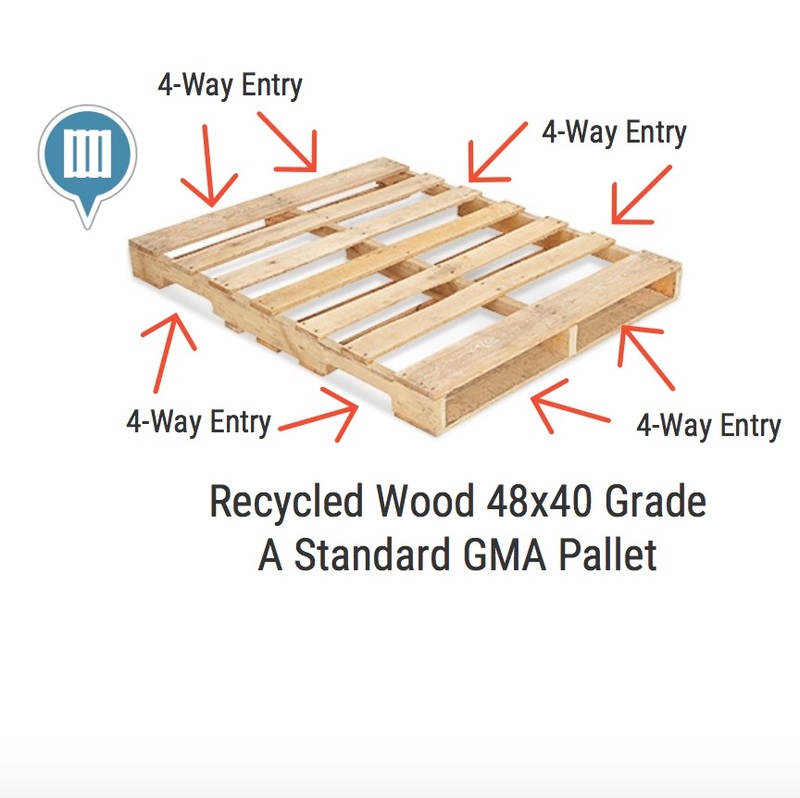 Be sure to follow a wood pallet-recycling guide. Objective: To determine which pallet will provide the accurate amount of protection for your goods being shipped and the safety of workers. When grading pallets the first step is to look at the appearance of the wood. The brightness or grayness of wood will affect the grading of the pallet. The brighter the wood the higher grade pallet it will receive. The appearance of the pallet should be square. When measuring the pallet all corners of the pallet should be square. Any deviations of 1 inch or more are unacceptable and will affect the grade of the pallet. A pallet should be clean from any contamination such as staples, cardboard, paint, grease, or other materials. The cleaner the pallet the higher grade of pallet it will receive. A pallet should have solid stringers. When grading a pallet you need to look for repairs to stringer boards. Some common repairs to stringer boards are metal mending plates and support boards called companion stringers or plugs. If a pallet stringer has repairs it will affect the grade the pallet receives. When grading a pallet, there should not be any deck boards or bottom boards missing. There should be 7 top deck boards and 5 bottom boards. In addition to having all the boards present, there should also not be more than a 3.5-inch gap between boards. The front and back deck boards called lead deck boards should be 6 inches wide. The middle deck boards should be 4 inches wide. The thickness of the deck boards should not be less than 9/16 of an inch. To grade deck boards and bottom boards you need to look for slits or cracks in the wood. You will need to make sure chucks of wood are not missing on end pieces. Be sure to also look to make sure the boards are securely fastened. All of these factors will help determine the grade of the pallets. All nails often referred to as fasteners must be completely nailed flush with the wood. Nails that are raised above the deck boards or sticking out of the side of stringers are not acceptable. Any nails not completely nailed in will affect the grade of the pallet. Pallets that have bright white wood, complete with deck boards, no stringer repairs, and flush nails receive A Grade Pallet Status. Pallets that have bright white wood mixed with gray or dirty wood, complete with deck boards and some repairs, stringers with repairs, and flush nails receive B Grade Pallet Status. Number 1 pallets are also considered A grade pallets. While Number 2 pallets are considered B grade pallets.